Telephone reservations with "operators standing by" for our spring show, Sylvia will begin on Monday, April 22nd from noon to 5 p.m. You may make a reservation online anytime prior to that date by clicking on the "reservations" link. You may also leave a message on the BCT phone line at any time with a reservation, and we will return your call with a confirmation. WELCOME TO THE 86th BCT SEASON! Donna Balsley will direct the show. Les Blumreich will be the stage manager. SYLVIA by A. R. Gurney brings us the story of Greg and Kate who have moved to Manhattan after twenty-two years of child-raising in the suburbs. Greg brings home a dog he found in the park—or that has found him—bearing only the name "Sylvia" on her name tag. A street-smart mixture of Lab and Poodle, Sylvia becomes a major bone of contention between husband and wife. She offers Greg an escape from the frustrations of his job and the unknowns of middle age. To Kate, Sylvia becomes a rival for affection. And Sylvia thinks Kate just doesn't understand the relationship between man and dog. The marriage is put in serious jeopardy until, after a series of hilarious and touching complications, Greg and Kate learn to compromise, and Sylvia becomes a valued part of their lives. In this production, the role of Sylvia is played by a speaking actress, and the roles of Tom, Phyllis, and Leslie are played by one actor. 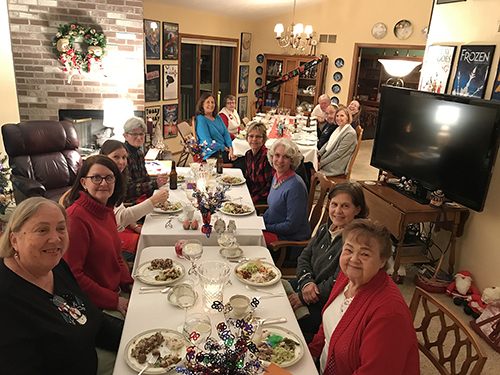 The board (and a few assorted "significant others") met in December for their traditional Christmas party. Last year, BCT was the recipient of a bequest of $21,700 from the estate of a long-time theatregoer. Air conditioning for our theatre had been a dream for BCT for many years. With an additional gift of $18,300 from P.A.P.A.S. 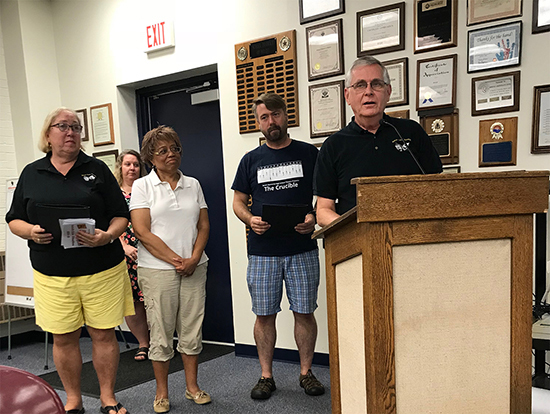 (Parent Advocates or the Performing Arts in Our Schools), we were able to present the School District of Beloit with a check for $40,000 for the installation of air conditioning. Making the presentation at a recent school board meeting were (left to right): Pat Hoye, BCT President; Jackie Jackson, founding board member of P.A.P.A.S. ; Greg Wallendal, P.A.P.A.S. President and current theatre director at Beloit Memorial High School; and Loren Sass, P.A.P.A.S treasurer and BCT Vice-President. BCT has fifteen members on its all-volunteer Board of Directors, each elected to a three-year term at the annual meeting. HAVE AN OLD VIOLIN IN THE ATTIC?